Each year, the president of NAU recognizes classified staff and service professionals who have demonstrated outstanding performance by awarding the President’s Achievement Award. This year, our very own advising coordinator, Chris Drake, has earned this prestigious recognition! Anyone who has worked with Chris knows how deserving she is…she is a rock star in The FCB and we’re fortunate to have her. The ProSell team missed the big snow, but did not miss a chance to show their outstanding sales and team skills. 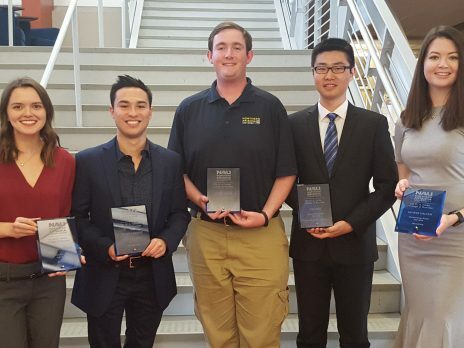 Seventy-five percent of our team made it to the second round, which is a huge accomplishment and helped to earn NAU second place as a University. In addition, Taylor Liniger got an honorable mention for her Visume and Bre Hushaw brought home a trophy for 4th place overall! Congratulations to the competitors! In an interview on radio station KJZZ, FCB Assistant Professor of Practice Ryan Fitch shared the outcome of his team’s latest research on the cost of fire prevention.